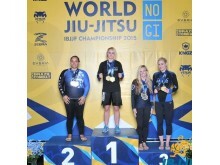 Friday 13 November – UK BJJ Athletes return home this week from the IBJJF No Gi World Championships in California with a haul of medals. Several athletes from gyms around the UK flew out to Long Beach, California to compete in the No Gi Worlds held at the Walter Pyramid Arena at California State University on November 7 and 8. 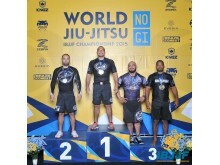 No Gi is an explosive and fast-paced variation of traditional BJJ which sees athletes competing without the traditional kimono. 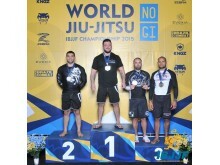 The IBJJF No Gi Worlds is the most prestigious event in the No Gi competition calendar, with athletes from all over the globe battling it out in their respective categories to become world champion. The golden run continued in the black belt categories, the highest level of competition. Tom Barlow became world champion for the third time, 3rd degree Scottish black belt Rick Young won gold to bring back the title in his division, and following on from championship wins at the Europeans and the British Nationals, Cornwall based Raphael dos Santos also became world champion. 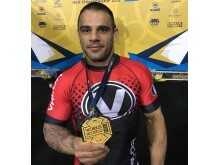 Charles Negremonte, who teaches and trains in London, won bronze, and Chico Mendes, based in Bristol and head of Checkmat team in the UK, achieved silver in his weight category and bronze in the open weight class. 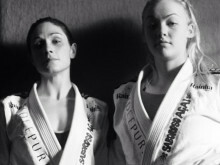 Both Chico and Raphael sit on the UKBJJA Council, offering their expertise and experience to ensure the future growth and success of BJJ in the UK. The success of the UK athletes at the highest level of international competition is set to continue into 2016, with male and female athletes flying out to Lisbon for the European Championships in January. 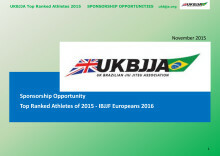 The UKBJJA is committed to supporting the development of UK athletes and is offering a sponsorship package for the top adult athletes of 2016 which includes not only financial support, but strength and conditioning and nutritional advice, as well as seminars from two of the world’s best BJJ competitors, Midlands-based Braulio and Victor Estima.